Mike received a B.S and M.A in Music Education from Hofstra University , and has studied the art of jazz and commercial playing with Jon Faddis and Christian Jaudes, classical trumpet with Dr. Leon Petruzzi, and Baroque trumpet with Kris Ingles. 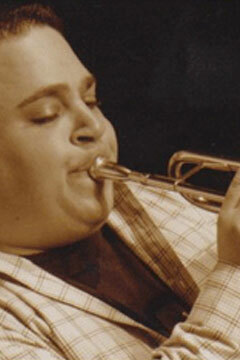 He is currently lead trumpet of the Black Tie Affair Orchestra, and is a soloist and lead trumpet player with the Leon Petruzzi Jazz Orchestra, New York's Most Dangerous Big Band, and the Rich Legunn Big Band and has played lead and solo trumpet with the Brian Lewis New Vinatge Orchestra, the Alumni Jazz Orchestra, the Long Island Jazz Orchestra, and the Mike Carubia Big Band. Mike is a first call player to the area's top club date bands, including Hank Lane 's Michael Hart Band and the Original Faze 4 Orchestra. He has performed regionally in over 120 musicals over the past twelve years for Gray Wig, Theater Three, Broadhollow, the Cultural Arts Playhouse, and many others. Mike has shared stages with Ray Charles, Phil Woods, Jon Faddis, the Lew Andersen Big Band live at Birdland, NYC, Todd Coolman, Jerry Weldon, Carl Fischer, Brent Carter, Byron Stripling, the Lalama Brothers, Chester Schmitz, John Pizzarelli, John Riley, Cecil Bridgewater, and many others. He was a long standing member of the great Carlton J. Smith and Friends band, a house band at B.B. King's of Times Square, with whom he performed on many Sunday's for almost two years. Dabbling in classical performance, Mike is a current member of the Symphonic Band of Suffolk County under the baton of Dr. Peter Loel Boonshaft and is the former principle trumpet of the Long Island Symphonic Winds, the New York Chamber Ensemble, and has performed with the Atlantic Wind Symphony. Mike can also be found currently performing with Long Island's best bands, such as "Ants Marching," "Soul Be It," "Emil Stucchio & The Classics" and of course, "Artificial Flavor."